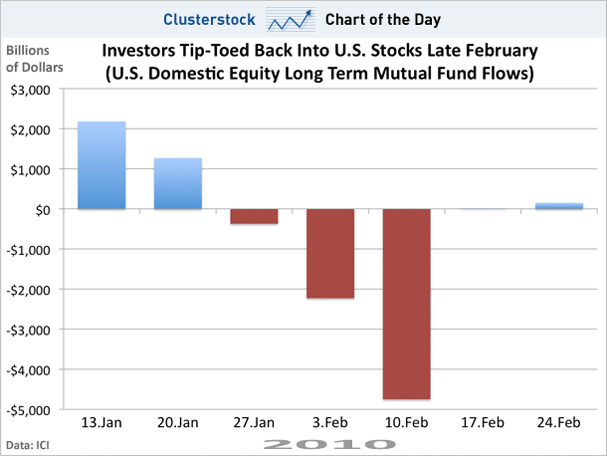 According to the most recent fund flow data from The Investment Company Institute (ICI), U.S. mutual fund investors came back to U.S. stocks in late February as the Eurozone was rocked with uncertainty. 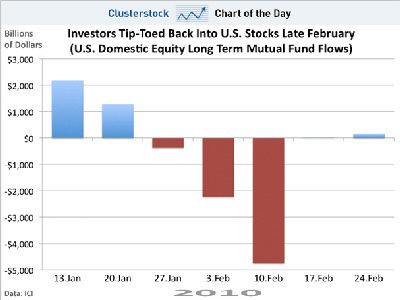 While fund flows were only mildly positive in mid-January and most recently late February, as shown below, keep in mind that a massive $39 billion flowed out of U.S. stocks in 2009 according to ICI (not shown). That’s why the green tip-toes below are significant. The average U.S. investor still remains highly sceptical of U.S. stocks, given the huge 2009 outflows that have yet to return… but… Europe’s travails or the prospect of a sustained U.S. recovery may have rekindled some faith in domestic equities, given that this is the second time in recent weeks that money has flowed into U.S. stocks.